Welcome to Casa Rector Beach House. This house is located one and a half hours west of San Jose (the Pacific side of the country). 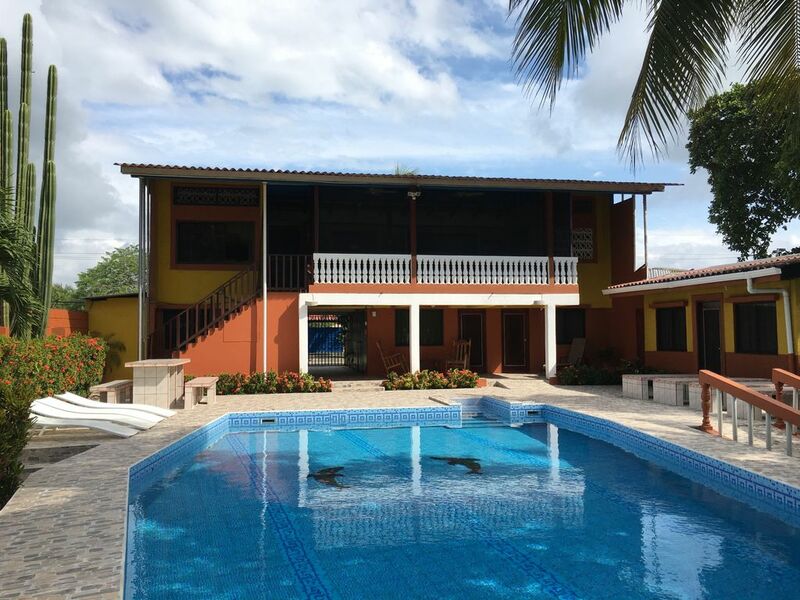 The house is approximately seven miles away from Puntarenas, a popular city in Costa Rica. The family-owned house is on a lot of property about two plus acres in size. The house includes six bedrooms: five of which contain their own bathrooms and one which connects. The rooms combined can accommodate twelve. The home is perfect for a group or for multi-families. The bedding and linens are supplied. The top floor of the house included the eating area and a full kitchen, stove, refrigerator, microwave, and utensils. Located on the property you can find six different types of fruit growing and many exotic flowers. The property also has a large, freshwater, ceramic tiled, in ground pool which is lighted by Sam Lighting. More Details: The pool is 3 ½ feet deep on the shallow end and 6 ½ feet in the deep end. Picnic tables and a barbecue hut are located around the pool. The beach is located at the edge of the property, we consider it our backyard. Once at the beach you can walk several miles in each direction. A gardener/guard is on the property at all times to ensure a clean and safe time. A cook or babysitter can be provided for an extra charge. The way the house is rented: we rent the whole house to the same renter whether it is a group or just a single family. December through April is the prime season. For more information please contact me. More pictures can be sent upon request. No charge for local calls Must use calling card to call the U.S.
Cable TVs in every room, Stereos, DVD, full kitchen, microwave, refrigerator with ice maker, cooking utensils, linens, washer and drier, private pool, charcoal BBQ hut, two dogs on the property. Casa Rector was a perfect fit for our group of 14. The pictures do not do it justice. The grounds are beautiful, Arturo does a great job maintaining them. Everyone had enough room to have their own space, but a great common area for meals and down time. And speaking of meals, Maribel's cooking was fabulous. We will miss Casa Rector as we treasure our memories of our time there. We chose it to have down time at the beach and that is exactly what it was. This house was PERFECT for our group of 7. It honestly could have easily slept twice as many people. Each room has it's own bathroom (which is great when traveling with teenagers). The caretakers were WONDERFUL! No only did we arrive to a fully cooked dinner and drinks, but They accompanied us to the grocery store so we would know how to find it. They offered to cook for us, do our laundry and gave us so much helpful information while we were there. I loved how every evening they would walk through the outdoor space after we all went to sleep and would bring in any personal items left out. Also we LOVED the dogs on the property. They were so sweet and well behaved. Our kids had so much fun hanging out with them. The location of the home is wonderful. It is very close to plenty of things to do, but far enough away to be very quiet and serene. We used the pool for most of our swimming, but the ocean is steps away. We easily found plenty of restaurants and shops in walking distance, along with taking a few day trips to the local towns for ziplining, animal sanctuaries, and waterfall adventures. Thank you so much for the wonderful stay Rich!!! You have been beyond helpful the whole way through our trip! We are four friends from (long-ago) college, and we had never been to Costa Rica before, and didn't know what to expect. Staying here was fun and easy, Arturo and Maribel, the caretakers, were kind and lovely. The owner connected us to Varso Travel, which made everything easy, from snorkeling in Tortuga to exploring volcanos—lunch included. Even on the hottest days, the pool was always welcoming. It is rustic—multiple beds per room, an extremely adorable puppy running around, no AC in the main eating area—but it was also comfortable and welcoming, with fresh cut-up fruit waiting for us when we arrived, and everyone willing to help us out whenever we asked. Michael of Varso Travel even brought us to a supermarket on the way back from the volcano so we could do a quick shopping trip. A really fun place to go. Thank you for that great review. We do take pride in making someones vacation the best we can. Beautiful house for large group/family vacation...beach and pool in the back yard! The pool was beautiful. The beach right there and the acvomidations were great. The most amazing thing about our stay was Arturo and Maribell, the caretakers for Casa Rector. They were great!!!. Maribelle cooked for us and the meals were delicious. She went to the grocery store with us and showed us what to buy. She kept the house immaculate and even went to the pharmacy when one of our family needed help. Arturo keeps the grounds beautifully and the pool. When we went to the beach he watched over us to keep us safe. He would pick up all our shoes and belongings at night and lock them up and lay them all back out for us the next morning. We felt completely safe with him there. Both were absolutely wonderful and we would have liked to take them home with us. The house was clean and comfortable. Plenty of room for 12 people. Air conditioning in all the bedrooms. We only ate out twice for lunch, the rest of the time Maribell cooked for us. The shrimp restaurant 2 blocks away is delicious. We would go back right now and stay there. We used Varso travel which was right down the street. Very convenient! Our group of 13 students and 2 chaperones had a wonderful time at the house and on the beach. The caretakers were very attentive and actually had a pizza and fresh fruit waiting for us at our arrival (2 AM!). I had to ask them to stop picking up after our group and wanted the students to be responsible for their things. The home was clean and we had plenty of hot water for showers our group of 15. The caretakers also got up earlier than our group and had coffee waiting on us each morning and prepared huge piles of drift wood for nightly bonfires on the beach. The grounds were immaculate with fresh fruit trees and the pool was cleaned twice a day. There was also plenty of wildlife - birds, iguanas, frogs on the grounds and crabs on the beach. The local town was not very welcoming to tourists, but we made excursions to Jaco, Waterfalls, Zip Lines, Crocodile Man Tour and Flora & Fauna Conservatories all of which were very welcoming to our group. I am looking forward to my next trip to Costa Rica - PURA VIDA! From the house it is very easy to make plans for sightseeing, fishing, rafting, and viewing the rain forest and volcanoes. A major hotel with a casino is located one mile from the house where all tourism plans can be made. The town of Jaco is a half hour by car south. It attracts many surfers for the beach's large waves and also tourists for its excellent restaurants and shops.